It’s August. Let that sink in. It’s. August. This is the time of year when the long, languid days of summer begin to feel numbered and our opportunities to connect with friends and family in that easy, quintessentially Summer-y way seem to be fewer and fewer. This got us thinking about the beauty of hosting a for no-reason-other-than-parties-are-something-fun-to-look-forward-to party. Because summer. And weather. And gracious place settings and swoon-worthy florals. And because, in the end, you don't need a birthday, a graduation, or a wedding as a reason to gather with friends. You just need a space and the desire to make memories. Because isn't that worth celebrating? So, what’s the difference between a cookout or BBQ and a Garden Party? Simply put, everything. The summer gathering can take on many iterations but if the old adage about getting out of something what you put into it holds true, then hosting an elevated event that will naturally set itself apart from the more casual gatherings that abound throughout the season, is totally worth it. A BBQ is easy, shoot a text to some friends with a date, time, and a request to BYOB and you’re set. A Garden Party does not need to be formal, but it should be thoughtful. From the appetizers to the menu to the wine you’ll serve, a little coordination goes a long way. 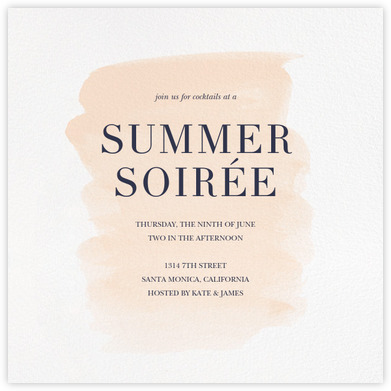 But first, the invitation… the mode with which you opt to invite guests says a lot about the tenor of an event. What tone do you want to set? While snail mail invites might feel over-the-top, a customized Paperless Post is a welcome respite from the barrage of texts your friends likely receive in a day. Paperless Post allows you to see if a guest has opened your correspondence and allows you to follow up accordingly. Haven’t heard back from someone? A phone call can be a lovely way to get in touch and find out if they can make it. Remember, this is all about connecting! Effortlessly upscale… by design, of course. Think family style! Family style simply means that large bowls and platters of food are placed on the tables for guests to pass and self-serve. This feeds a genial “holiday” vibe and lets guests get to know each other as they decide what they’d like to try. Family style can be a nice way to control the quantity of food served while still offering people the ability to decide what they feel like eating. Guests will often ask what they can bring to the table… by all means, accept those offers! That said, you may find it preferable to allocate a specific course such as desert or appetizers to contributions of family and friends. Don’t be afraid to be specific and ask for what is needed. You should always know what food you have and what is coming. Come as you are. Leave when you will. The modern Garden Party might be defined as a happy sort of chaos with points of interest covering the grounds. The area need not be large, just well-defined. Create layers & levels throughout. Think layered outdoor rugs, soft blankets, and poufs or floor pillows for post-meal lounging, shady retreats for eating and connecting, and sunny spaces adorned with swings and cooling mist fans. With a bit of mindful planning, you’ll achieve spaces in which children feel free to run and play as well as more intimate zones designed for adults to enjoy music, conversation, and an aperitif. The goal is to imbue the celebration with a freedom of movement that encourages guests to come when they can and leave when they must. You must have a good time! There is nothing more unnatural than enjoying a cocktail while attempting to chat up a friend and seeing the host fluttering about cleaning up after others. It puts unnecessary pressure on your guests to join your efforts and can lead to the feeling that the party is ending. Hire help if you can, or assign close family members small tasks to ensure that you’ll have time to enjoy your own party. Your guests will thank you for it. Utilize a variety of unexpected seating options at the table. 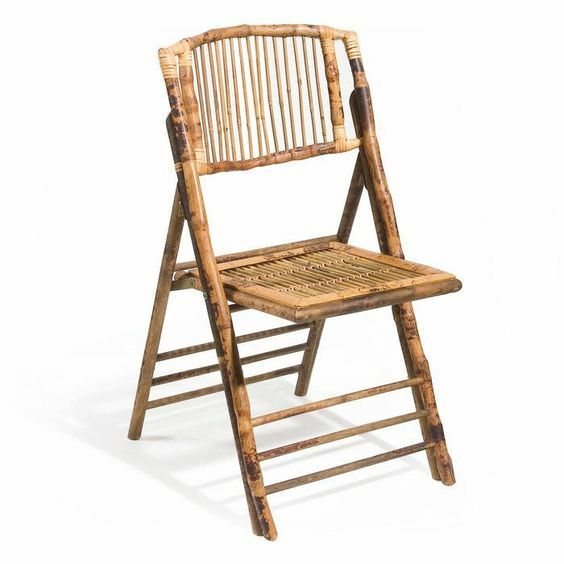 Wooden folding chairs work just as well as cozy poufs as long as the approximate seated height is taken into consideration. Proper lighting is an essential part of creating the right vibe for any space and it helps keeps the party going safely after dark. See our Pinterest board for some fun and funky options. The perfect solution to your seating quandary. Available at A. HOME. Contact us for details! 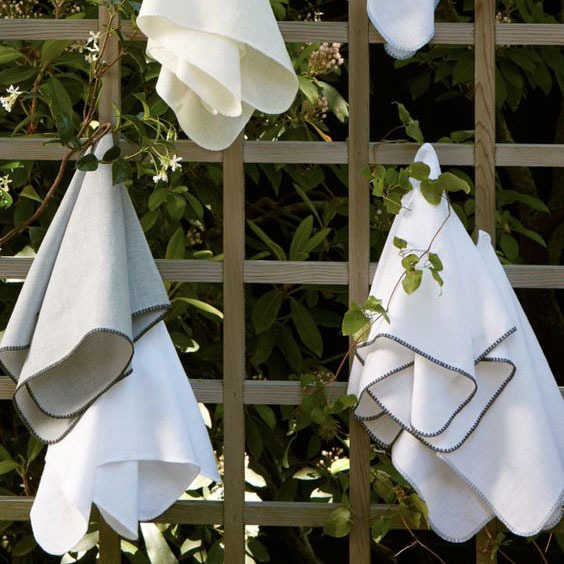 Tonal sophistication and intricate handiwork come together in our Calypso collection – an easy care blend with the classic beauty of pure linen – featuring a playful shell stitch edge. By MATOUK. Contact us for details! 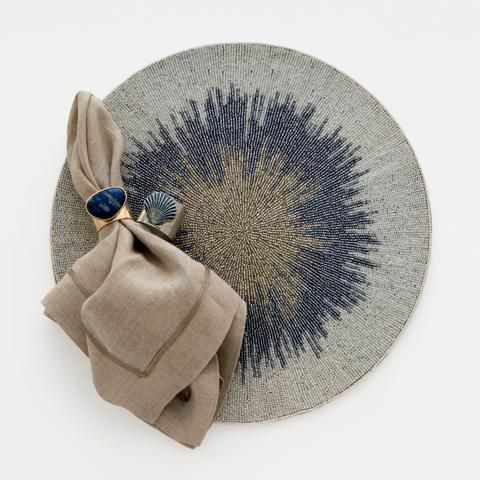 Beaded placemat in Cobalt by Joanna Buchanan. Available through A.HOME. Contact us for details! Printed leaf dinner napkins in cobalt by Joanna Buchanan. Available through A.HOME. Contact us for details! Save a glass with these unique honeybee wine charms by Joanna Buchanan. Available at A. HOME. Contact us for details! The new summer classic - Joanna Buchanan's Stripey Bee table runner. Available through A. HOME. Contact us for details! 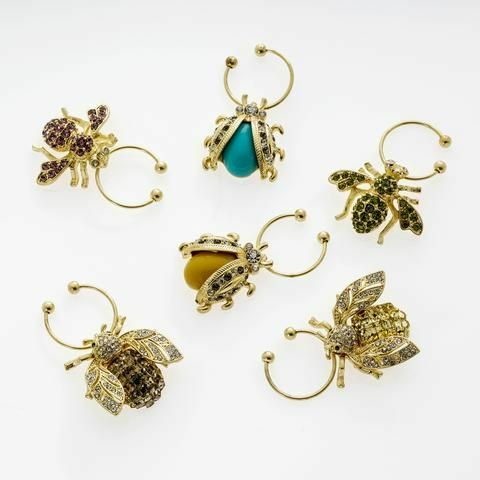 Welcome guest to your table with these delicate jeweled bee napkin rings by Joanna Buchanan. Available through A.HOME. Contact us for details! Whimsical bamboo napkin rings by Joanna Buchanan. Available through A. HOME. Contact us for details! Hand beaded placemat with green scalloped edge by Joanna Buchanan. Available through A.HOME. Contact us for details! Hand beaded ombre placemats in Blue by Joanna Buchanan. Total swoon. Available through A. HOME. Contact us for details! Charming hand beaded placemats by Joanna Buchanan Available through A.HOME. Contact us for details!